An invitation is extended to Conference delegates to attend the ICASSP 2016 Welcome Reception at the Shanghai International Convention Center. Renew old friendships and make new acquaintances as we welcome you to Shanghai. Cost for the ticket will be included in your registration. Cost: US$5.00. Advance registration required. Motivation is the power that propels us to reach our goals and dreams. My talk is about motivation through the eyes of a woman who is a mother, an engineer, a professor or a practitioner. What are the sparks that trigger a technology vocation in a little girl? What are the barriers she may find along the way? What keeps her motivation alive? What can we do to help her? I don’t have the answers, but I’ve managed to protect my motivation despite the challenges I’ve found during my career. This is the experience I would like to share with you. Roxana Saint-Nom (SM) received the Electrical Engineering degree in 1987 from ITBA (Buenos Aires Institute of Technology), Argentina and received a Masters degree in Speech Processing called “Diploma de Altos Estudios” from the Universidad Politecnica de Madrid, Spain in 2003. From 1988 to 2013, she has held academic positions in Argentina. She became a tenured faculty with the rank of Full Professor in 2004. From 2007 to 2013, she was the Electrical Engineering Department Chair at ITBA. She received the leadership training certificate from the Institute for University Management and Leadership at the Inter-American Organization for Higher Education (IOHE) in 2008. Since 2013, she took the opportunity to work in a company that develops technology devices for Latin America, called Eurocase. She is in charge of the Engineering Division. Among the projects which are on the market, there is a Tablet prepared for small children, with content specially designed for Early Education. Both SP related and/or science oriented apps has been developed under her guidance. She is a Senior Member of the IEEE. Her Signal Processing Society activities includes: Founder and Chair, SPS Argentina Chapter (2004-05 and 2008-09); Member, Chapters Committee, Region 9 (2008); Chair, Signal Processing Education (SPEd) Technical Committee (2007-09); Member, Conference Board Member (2007 and 2009) and Member, ad-hoc Lensing Oversight Committee (2008-09), Subcommittee Chair (2010-2012), SPS Regional Director-at-Large for Regions 7 & 9 (2011-2013), Women in in Engineering Committee member, as SPS liaison (2012-2013). Advanced Ticket: USD$110 per person. 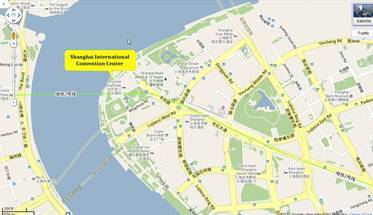 We invite all ICASSP delegates and their guest to join us in the ICASSP 2016 Banquet to be held in the Shanghai Hall of the Shanghai International Convention Center. Renew old friendships and make new acquaintances as we welcome you to Shanghai. The meal will be a Chinese style multi-course shared dishes. We shall be diligent to provide sufficient varieties to satisfy various (e.g. Kosher, Vegetarian) dietary constraints). Cost for the advanced ticket will NOT be included in your registration fee. Shanghai International Convention Center is located in the heart of Lujiazui, Pudong – Shanghai’s Financial and Trade zone, facing the multinational styles of architecture along the Bund across the Huangpu River. It enjoys superior geographical position, easily accessible from all parts of the city with modern transportations private and public. SHICC has successfully hosted IEEE Conferences recently: INFOCOM’2011 and WCNC’2013.